Earlier this week, I posted a picture I took of Kitty Paw laying in the sun. I thought for my Pixel Perfect entry, that I’d share my editing steps with you. I’ve also been asked to share a little insight into how I select and apply textures. As I’ve said before, I shoot in full manual…RAW, so it requires that I send every photo through Adobe Camera Raw (ACR) – I guess technically, you could make the argument that the SOOC above is not a true SOOC, but it’s the JPG converted version, so there. Anyways, in ACR I don’t think I did anything with the exception of brightening and adding a touch of contrast. If you’re interested in clean processing that starts in ACR, check out this link from Two Peas in a Bucket. I essentially do the same thing they do in ACR…they just explain it better. I then brought it over to PSE7. 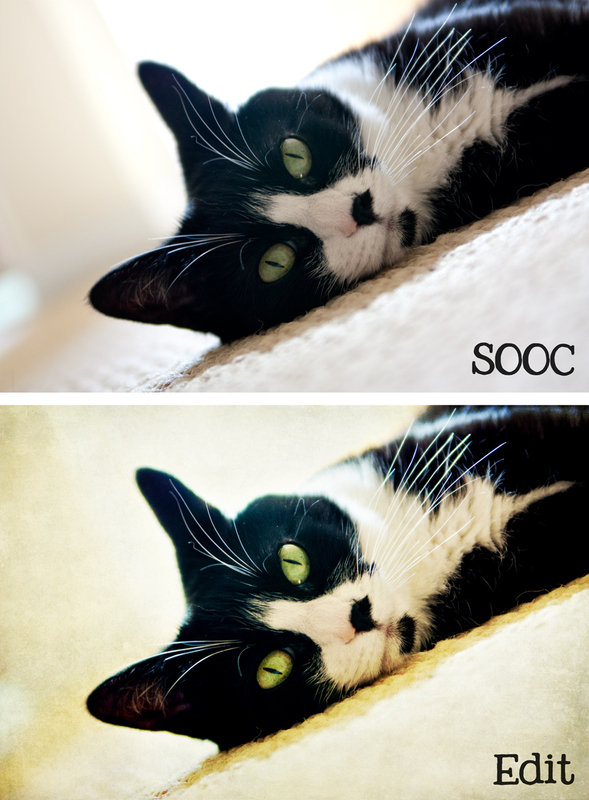 I do use Amy McMaster’s Squeaky Clean on every photo, not because I don’t know how to do it manually, but I cannot create my own actions in PSE7. Therefore, I rely on smarties like Amy McMaster to create good workflow tools to simplify my processing steps. Essentially, I adjust the levels, add a little more saturation (especially to make her eyes pop), and apply noiseware to clean up the photo. For this photo, before adding textures, I applied Paint the Moon’s Sunny Days action. I don’t recall making any adjustments to the layers. To be honest, I stayed on that photo a long time before adding any texture because it was nice and clean. At this point, I started applying textures. I’ve been asked for some insight on how I apply textures…and even why I would choose to apply certain texture layers to a given photograph. I was first turned onto textures back in February when I saw the “fairy garden” effect demonstrated on I Heart Faces. If I’m honest, I think I first started using textures to disguise the fact that I had no clue what I was doing with my camera to begin with…I now realize that texture should be used to ENHANCE images that were shot correctly in camera. Now that I’ve spent some time learning how to properly expose my shots…texture enhances my images and doesn’t cover up my mistakes. In terms of what textures I choose? You’ve first got to determine the mood you’re trying to create by using texture: moody, dark, mysterious (Shadowhouse’s grungy textures definitely create those moods)…or gentle, sweet, soft, etc (Paint the Moon, Johnna LaFaith or Florabella creates those moods). I tend to use my softer textures with my pretty macro shots, but in the shot above…I went with a grungier effect. I also really like to create a vintage look through the use of vintage wallpaper (DeviantArt). I encourage you to experiment. Look under Inspiration for lots of texture links. If you want more on blending modes, click here. Like I said earlier, I followed a few tutorials when I first got started and then experimented. What have I missed? Ask me anything.